StrapsCo’s vintage 1960’s inspired rubber rally watchband. 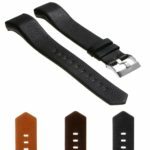 These waterproof dive straps are constructed with premium silicone rubber and embossed with a pebbled texture finish. Finished with a brushed stainless steel tang buckle. Dust-proof, water-resistant, and extremely comfortable to wear. Integrated quick release spring bars allow you to swap straps in seconds without the need for tools.